A compelling photographic record of the fourteen female senators who are changing the balance of power in America's most prestigious governing body. They are America's most powerful women. The fourteen female U.S. senators currently in office have changed not only the face of power, but the exercise of power as well. Bringing women's perspectives and life experiences to what has been described as America's most exclusive (and exclusively male) club, female senators are emerging as powerbrokers in Congress, known for their bipartisan teamwork, compassion for social issues, ability to build coalitions, and use of unique tools for lawmaking. 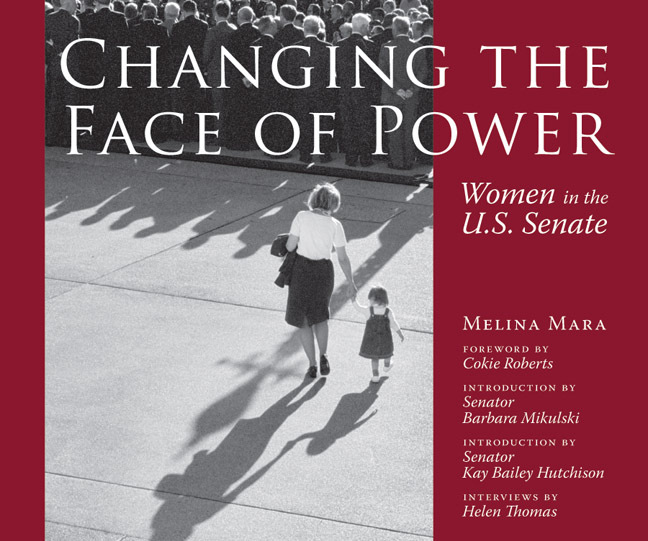 This pioneering work of photojournalism documents all fourteen women in their day-to-day work as senators. Melina Mara's candid images show the senators attending hearings, meeting the press, greeting their constituents, consulting with staff, legislating behind the scenes, and sharing private moments with colleagues and family. The photographs capture the demanding, 24/7 nature of the job and show clearly that the female senators more than hold their own among their male colleagues. Accompanying the photos are a commentary by journalist Cokie Roberts, introductions by Senators Barbara Mikulski (D-MD) and Kay Bailey Hutchison (R-TX), and interviews between veteran White House correspondent Helen Thomas and all of the senators. These pieces address women's achievements in attaining political power and frankly describe the burdens and rewards of the office. The senators describe their motivations for being in the Senate, the challenges they've faced, the way they balance work and family, and the prospects for a woman winning the presidency in the coming years. As Congress becomes a truly representative institution for the first time in its over-two-hundred-year history, the women who have been pathbreakers in the Senate well deserve this photographic tribute. Changing the Face of Power is at once headline news and a potent documentary record of a turning point in American and women's history. Appendix 2. Women in the Senate: Do They Make a Difference? Melina Mara is a staff photographer at the Washington Post , covering Capitol Hill and politics. Her work has appeared in numerous publications, including daily newspapers and weekly news magazines across the country. Mara has received numerous photojournalism awards from the National Press Photographers Association, Associated Press, and regional competitions. Her Women in the U.S. Senate photography exhibition, from which this book comes, opened at the Smithsonian Institution, where it was viewed by hundreds of thousands of people, and continues to be exhibited around the country. Each of the women of the United States Senate has her own story of personal courage and achievement. Many of us didn't come to politics by the traditional route, for example, being in a nice law firm or belonging to the right clubs. Instead, we got involved because of a community need—that's what happened to me. I believe in "operationalizing your good intentions." As a young social worker, I fought a highway that was going to destroy Baltimore communities, including the East Baltimore neighborhood of Highlandtown where I grew up. This highway would have sliced neighborhoods in half and destroyed the homes of people trying to live the American dream. I used principles of community organizing to fight this road, the same skills I use today in the Senate. Before I came to the Senate in 1986, in all of American history only fifteen women had served in the United States Senate; one served only a single day. I was the first Democratic woman elected in her own right, and I knew that put me at an initial disadvantage. It wasn't just that the gym was off-limits. I didn't have any natural mentors to show me the ropes. I knew I didn't want to be one of the boys, but I did want to be one of the gang. So I did two things. First, I asked for help. I established a relationship with the old guard and asked for advice. I was respectful of them, and respected the rules of the Senate. Second, I did my homework. I went to all of the hearings and showed up on time. I read all of the reports, traveled with the other senators on fact-finding trips, studied the issues, and became known as reliable. Because I worked hard and formed alliances, I was rewarded with powerful committee assignments and the respect of my colleagues. Though I was the first, I didn't want to be the first and only. I wanted to be the first of many. When four women joined me in the Senate in 1993, I was so proud. It would not be every woman for herself in the Senate. I proudly took on the role of mentor and adviser. I organized a workshop for my new colleagues, so I could teach them the inner workings of the Senate, explain how to organize their new offices, and show them how to get on the best committees. I shared with them the organizing principles I use to guide my office—things like "We cannot always guarantee an outcome, but we can guarantee an effort" and "Our constituents have a right to know, to be heard, and to be represented." I wanted to open some of the doors that had been opened for me, and make sure that the new women in the Senate would be successful. When my Republican colleague Senator Kay Bailey Hutchison joined the U.S. Senate, we were determined that bipartisan civility would begin with us. Now, at the start of every Senate, I hold a bipartisan power workshop for all the women of the Senate. We started the tradition of monthly dinner meetings for all the women senators to build friendship and fellowship; we have been through adoptions, showers, and weddings and have built common ground. I'm so proud that the women of the Senate work together, act as role models and mentors for other women, and make a difference by standing up for a variety of issues important to women and families. Together, we are opening doors for the next generation of leadership. When I first looked at Melina Mara's photograph of my daughter, Bailey, walking with me, I was stunned by the impact of that simple black-and-white image. Melina captured a private moment and made it a powerful statement about the changing nature of leadership and representation in our country. This scene—a mother leading her toddler daughter toward a sea of men in dark suits—could never have been possible in the past. The daughter has wandered away from the event, unconcerned about its importance, focused solely on emulating her mother's steps— unaware that the steps are breaking barriers for her. The photos in this book are an amazing compilation that display a modern and seldom-seen side of the United States Senate. The images of the fourteen female senators tell a quiet story of strength, hard work, and perseverance. The intimate way in which the collection chronicles the revolving roles of legislator, mother, and leader provides a snapshot of the unique life of a woman in the Senate, and puts on the image of the Senate a different face, a different pair of shoes, a new perspective. The Senate is a staid, formal institution sometimes billed as the "greatest deliberative body in the world." It's not known for its well-developed sense of humor or for adapting quickly to change. Though the serious nature of our business remains, the vitality and diversity that women have brought have contributed greatly to the chamber and, more importantly, to society at large. Melina is owed a debt of gratitude for capturing these remarkable images. Depicted in black, white, and shades of gray, our day-to-day lives on Capitol Hill tell more than just personal stories. They foretell change. Melina worked tirelessly and creatively to sense the interesting moments and record them without our noticing she was there. I never even saw her the day she took the cover picture. The collection indeed shows the changing face of influence—it is a face that looks much like the one seen in the mirror by half of the United States population. These images symbolize the way in which our nation is becoming a place where each child—boy or girl—has a real and equal opportunity to succeed. When Bailey grows up, it is my hope she won't see our picture as symbolic at all. She'll think of it as a sweet moment captured by a photograph.